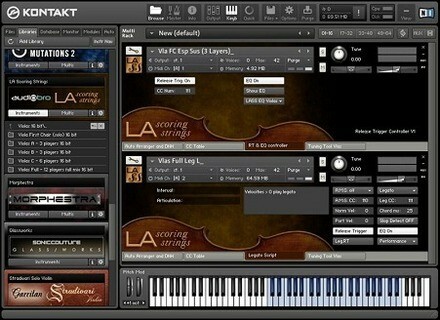 LA Scoring Strings, Virtual strings ensemble from Audiobro. Product replaced by the Audiobro LA Scoring Strings 2.
songboy's review"Add a few violins to sweeten the track, or score a symphonic masterpiece "
I run this of course in Kontakt 4 and 5 as it was designed on a Mac Pro and a Macbook Pro i7 with an RME Fireface 800 in Logic 9 and ableton 8. So far it has been extremely stable and has caused no issues with either computer. If you are deciding to score that big movie track or the like, you probably want to have a decently beefy computer as you will need to stack quite a few instances to get the full control you will need. As for ease of use, this is plugin is not for the light hearted. You can get up and running pretty quick, but if you don't know a lot of the terms and nuances of these instruments, you will have to do a fair amount of crash course learning to get proficient and efficient. I spent quite a lot of time playing with all the parameters and listening to the subtle or sometimes drastic effects they caused and I still feel like a novice on this thing. That's not to say I haven't made some sweet tracks with it though. I've even used this plugin for performance on several occasions and had great results. Unlike most string patches found in almost every synth these days, this plugin is really based on the individual or small group (or chairs) of instruments. So the detail of each individual violin, viola, contrabass, etc... can be edited and expressively played. For example, play middle c on a solo violin patch on any synth and quickly jump up to the next octave up. Most likely it just stopped playing the lower c and started playing the higher c. In LASS, if you do the same thing, you get a clear and wonderfully sampled sound of a violinist sliding his finger up the board (this can be a glide effect or simply the natural sound that comes from physically switching notes on a violin depending on how you strike the key). It's so realistic that I was at home one day practicing with it and my girlfriend came in expecting me to be holding a Violin. She was really surprised as she said it sounded completely real to her. Now, onto the price. $1000 is a heck of a lot of money to drop on sound samples indeed. Luckily the studio paid for this and got us licenses to use them on our personal computers so I didn't have to worry about the price. As an individual, I probably wouldn't have paid this much as I don't use this plugin enough to justify the cost, BUT, they are absolutely worth the money if you are intending to do a lot of scoring. I have heard examples of tracks created by this plugin that have been used in actual fairly big movies and I have to say, I couldn't tell the difference between those tracks and ones in other movies that used real symphonies. As for what I like the best of these samples, it would have to be the expressiveness. As mentioned before, it is extremely realistic and there virtually no clunkiness in the samples that you might expect from such a large expressive library. I definitely recommend this to people who can afford it and will use it because I have yet to hear a better string instrument Library. 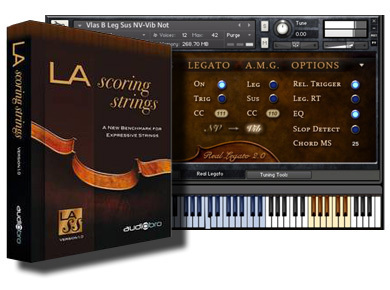 Audiobro's LA Scoring Strings is software and a set of samples for strings. While obviously geared at those who are scoring film and looking for string sounds, these can be used across the board in any style as great string sounds are great string sounds, and that's exactly what these are. LA Scoring Strings have become very well known in the industry and by those DAW users looking for extremely realistic sound string samples. You can get LA Scoring Strings in a variety of different sizes as they've got a bunch of bundles to choose from, so even if you can't afford the full on collection, you can still have some great sounds for a reasonable price. I'm pretty sure you can get LASS for any system, but I've only used this as an instrument in Logic and on a Mac Tower computer. While the sound quality of these strings is of course top notch, it's really how you can play them that makes them great, as they feel and sound very realistic. I love the versatility here as you can get everything from full orchestral sounds to simpler violin or cello sounds, all of which are extremely realistic sounding. In general the sounds don't come off as stale and fit very well into the mix or sound great on their own. I've tracked a few parts with these in Logic to audio that I've recorded in Pro Tools and have been extremely happy with the end result. Everyone who wants some very high quality string sounds in all varieties should check out LA Scoring Strings. It's easy to navigate through sounds and you'll be astounded as to how much is here. The price is reasonable even for the full collection, so if you're serious about your string sounds, scope out LA Scoring Strings now! Mafoomafoo's review (This content has been automatically translated from French)" Amazing!" A collection of violins features the utmost respect for all. It runs on software sampler Kontakt 4. I strongly recommend a minimum of 4 GB on Mac, 8 to be completely comfortable. The rponses have my surprise though since VSL volumes that I found not too bad but the era too clean, they did not, unfortunately, with everything, LASS has taken a step in the glove processing layers and rponses, I really wonder how they could .... In short, I use it for 11 months now, it's an excellent complment in sessions. It is the program I think the most successful to date.